It's London, 1872, where 17-year-old heiress Leonora Somerville is preparing to be presented to upper upper-class society -- again. She's strikingly beautiful and going to be very rich, but Leo has a problem money can’t solve. A curious speech disorder causes her to stutter but also allows her to imitate other people’s voices flawlessly. Servants and ladies alike call her “Mad Miss Mimic” behind her back…and watch as Leo unintentionally scares off one potential husband after another. London is also a city gripped by opium fever. Leo’s brother-in-law Dr. Dewhurst and his new business partner Francis Thornfax are frontrunners in the race to patent an injectable formula of the drug. Friendly, forthright, and as a bonus devastatingly handsome, Thornfax seems immune to the gossip about Leo’s “madness.” But their courtship is endangered from the start. The mysterious Black Glove opium gang is setting off explosions across the city. The street urchins Dr. Dewhurst treats are dying of overdose. And then there is Tom Rampling, the working-class boy Leo can’t seem to get off her mind. As the violence closes in around her Leo must find the links between the Black Glove’s attacks, Tom’s criminal past, the doctor’s dangerous cure, and Thornfax’s political ambitions. But first she must find her voice. "There are things I cannot say in any voice. I was born Leonora Emmaline Somerville, but I am not at all sure that is who I still am." Leonora Somerville is a beautiful, rich and elegant young girl growing up in Victorian era London. She is known by a number of names: Stumbletonge, Mutemouth, Crippletongue. Leo's speech impediment prevents her from speaking without stuttering. yet gives her a unique ability to mimic the voice of others. This ability has lead others to whisper another name for her - Mad Miss Mimic. Leo's sister, Christabel, sees her as nothing more than a burden. She treats Leo like a doll - one that she dresses up and primps for potential husbands to admire. Mad Miss Mimic is a love story, a mystery and a thriller all entrenched into one captivating novel. The setting. It's a combination of two things that I love London and historical fiction. Sarah Henstra does a fantastic job of transporting the reader through homes of the rich and powerful and the slums of the city streets. The characters. It is nearly impossible to not fall in love with Leo. Her speech impediment and mimicry is so unique and captivating. When she struggles to find her voice, it is hard as a reader to not want to reach out and help her. The empathy you feel for her is soon replaced by the urge to cheer her on as she chooses to use her actions in place of her words. Her bravery to step outside of what is expected of her is inspiring. The other character I adored was Tom. Tom is Dr. Drewhurst's assistant who quickly becomes Leo's guardian in the shadows. Their relationship, though complicated, blossoms into much more as they are faced with several obstacles to uncover the mystery of the Black Glove. 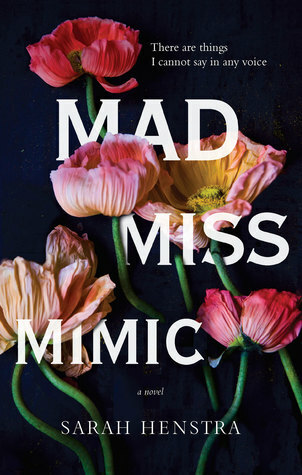 Secondly, Mad Miss Mimic is The Morning Show Book Club's March pick. After reading the book, you can enter to win Tea4Two. Check out the details here. The contest closes on March 30, 2016. I would love to hear what others think of Leo's mimicry. What would you do if you encountered someone with her ability? Let me know in the comments. What an unusual and interesting book! Great review too, you made me like Leo a lot!